MTR Corporation, the operating company for Crossrail concession services, has launched an all-new open access train service linking Sweden’s two largest cities Stockholm and Gothenburg. The MTR Express service will be run with a total of six brand new FLIRT trains built by Swiss manufacturer Stadler. Each train has five carriages and can carry 244 passengers. 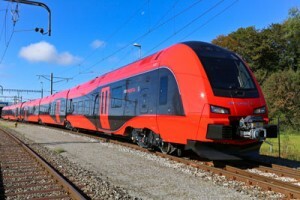 MTR Express will serve the 455 kilometre route with a fleet of brand new energy efficient Swiss-built trains designed for Nordic weather conditions. A fleet of brand new Stadler FLIRT trains will operate the service and will provide ergonomically designed business class seating throughout to ensure a comfortable travel experience for all passengers. The new intercity service will provide 90 weekly train trips between cities. MTR already operates the Stockholm Metro and is responsible for running and planning the system spanning three lines with 100 stations, 108km of track and 1.2 million journeys per weekday. Elsewhere, MTR will begin running Transport for London Rail branded services between Liverpool Street and Shenfield from May 2015, as the first part of the Crossrail concession. 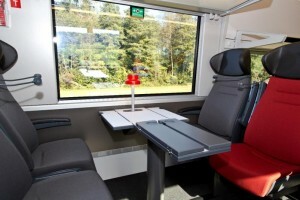 The MTR Express trains offer unrivalled comfort on the Stockholm to Gothenburg route including optional meal service. Jeremy Long, CEO of MTR’s European Business, said: “2015 is going to be a busy year and the launch of MTR Express is just the start as we will soon be taking over operation of Crossrail whilst also continuing to develop our services on London Overground.